Sort of a diversion this one, a sideline opportunity if you will, yet one with a story featuring cast of characters who were becoming quite familiar around these parts as of late. Ulysses “Bobby” Nunn may not have been known to the world at large by this point but we’ve met him multiple times over the past few months and will continue to encounter him consistently as the leader of two important vocal groups for another decade in rock ‘n’ roll. So too with Dootsie Williams, a trumpet player who’s popped up on a handful of West Coast recordings behind Big Joe Turner to date but who will in short order go on to make a far bigger impact as an entrepreneur. Johnny Otis needs no introduction by now but as with most developments on the California rock scene of the late 1940’s he’s got his hand involved in this plot too. All of these characters converge today due to the simple fact that unlike mainstream pop music and those fortunate enough to have long term contracts with major record labels and be handled by talent agencies who arrange for lengthy stays in classy venues and the occasional radio show spot, rock ‘n’ roll was the realm of hustlers, dreamers and the occasional scam artist. Everyone scrambling to be heard, grabbing appearances at any joint that would have them and taking whatever opportunity that may be presented them to cut a record. Not long ago the possibilities available for those partaking in this type of music were few and far between, the chances of being noticed were slim and those who did get a rare shot at glory might not get another if it didn’t pan out right away. But now in mid-1949 it seemed as if everybody with any ambitions for stardom in rock had all the opportunities they could ever dream of just waiting for them to grab hold and take. Bobby Nunn had arrived in Los Angeles in 1948 and like so many others found his way to Johnny Otis’s newly opened Barrelhouse Club where he entered the very popular Thursday Night Amateur Competitions. There he’d teamed up with Leard Bell, another newcomer to the scene, as they’d trade lines from Big Joe Turner songs on stage to the delight of the audience. Both Bell and Nunn would get their chance in short order to work with Otis, although not together and not exactly in the way they’d first presented themselves. Bell, who was from Kansas City, took an opportunity to jump behind the drums when Otis, a drummer himself, was called away from the bandstand. Whatever business he was tending to as owner of the club became of secondary importance once Johnny heard Bell go to work on the drum kit. He hired him on the spot, gave him the rather obvious nickname “Kansas City” Bell, and dubbed him his “human rhythm machine”. Bell would stick with Otis’s group until the late 1950’s when the more complex percussion styles that were emerging as rock continued to mutate proved beyond Bell’s simple yet powerful approach. The two parted ways and never spoke again, costing Johnny one of his dearest friends. As for Nunn he got his chance not long after Bell’s hiring as Otis was in need of a vocal group to perform on record and had the idea of combining another amateur night hiring, The A-Sharp Trio, with Nunn to form a Ravens-like group with Bobby taking on the bass leads a la Jimmy Ricks. Though essentially just glorified sidemen on that first record, My Baby Done Told Me, and credited as The Four Bluebirds, a name Otis chose without their input, their careers were officially off the ground and they parlayed that into their own session for Aladdin under the name they chose themselves, The Robins, getting two releases, one at the tail end of May, the next in June. But at the same time all this was going down Nunn found time to cut sides as a solo act (though he was billed as it being Bobby Nunn & His Hot Five) for Dootsie Williams who’d just created his first record label, Blue Records, which launched in May 1949. What the other Robins thought of this isn’t known but I can’t imagine they were too bothered by it. They too knew the realities of this business and since they’d only recently been thrown together, ostensibly for a single side that was issued under Johnny Otis’s name no less, it wasn’t as if Nunn was risking breaking up a long-established group whose members were reliant on one another for their livelihood. In a half dozen years when he’d leave them at the height of their popularity to form another group that would go on to even greater fame they might not have felt so magnanimous, but we’re getting ahead of ourselves. 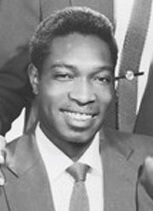 For the time being Bobby Nunn was just one of many skilled singers in this rapidly expanding marketplace whose talents were in demand by record companies who were a lot like the artists themselves – all trying to take advantage of the growing popularity of rock ‘n’ roll while it lasted. Just because all involved had their sights set on grabbing a prime slice of the rock ‘n’ roll pie doesn’t necessarily mean they’ll have their bellies filled the first time out. For starters Nunn’s name recognition was minimal even in Southern California, and to make matters worse he not only wasn’t singing within the confines of a group setting this time out, but he wasn’t even using the same voice as he’d been utilizing while he was with The Robins! Remember, Otis had created that group for the express purpose of competing with The Ravens who had in lead singer Jimmy Ricks the pre-eminent bass vocalist in all of music, a drawing card of epic proportions whose sound was as unique as anybody you could find. Otis had attempted to alter that last point to read… as unique as anybody you could find other than Bobby Nunn of The Robins who was told to basically mimic Ricks the best he could. And he WAS good, but perhaps seeking to show he was more than simply Jimmy Ricks’ doppelganger, for I Got A Country Gal Nunn takes the lead in baritone, never once dropping into the lower register he’d been using elsewhere. Now there are some who feel Nunn was a better baritone singer than he was a bass, but that’s not an opinion shared here. He was a decent baritone but hardly stood out and while he wasn’t in Ricks’ league as a bass either (nobody was), the fact that it was a rarer sound to begin with – there were not many bass leads then or in the years since – and it allowed for a more exaggerated delivery to give it character, meant that he was far more likely to stand out when sticking to his lowest range. The lack of backing vocalists on this might not be a hindrance in theory, since after all there were a ton of solo singers on the scene and they did just fine, but Nunn’s shortcomings become more evident without others to fill in the holes he leaves in his presentation. For some reason he sounds out of breath here, which is surprising because while the tempo may be brisk it’s hardly frantic. Yet by the end of some of the lines he’s clearly left gasping for air which not only dilutes the message he’s imparting, but also makes it seem as if this was something of a dry run that would be tightened up in a subsequent take. The song itself is hardly anything special either. The theme is fairly thin – he’s critiquing his own girlfriend for what she’s lacking, yet claiming he’s perfectly satisfied with her because she’s “his” – and the lyrics live up to that low standard at every turn. It’s little more than a series of half-hearted declarations and defenses wrapped in an uneasy bundle. You almost expect Nunn to break into his speaking voice to tell his buddies to “Just lay off, guys, at least I HAVE a girlfriend!”, if they’re giving him the business about her lack of looks, charm or personality. As odes to the love of one’s life go this is decidedly lacking. You just hope this young lady is not going house hunting and sending out invitations to the wedding just yet. But while Nunn is shorn of vocal assistance and a quality composition to work with here, luckily he’s not deprived of adaquate musical support, which is where this tries to make up for its deficiencies in those other areas. Dootsie Williams of course was a well-known trumpeter with a long list of credits dating back years and we’ve met him working behind Big Joe Turner a couple of times, albeit not to Turner’s benefit. What I think I Got A Country Gal shows therefore is something we alluded to on those Turner misfires, namely that it was the record label, in that case MGM, who were determining the style they were pursuing on those tracks rather than letting the musicians work things out on their own. Here Williams assembles a crack crew and gives them the order to rock and they do just that. The song crackles with electricity, from the two-fisted piano intro and snapping drums to Maxwell Davis’s sax which keeps things rooted in modern outlooks. The solo in particular is invigorating without getting carried away with trying to raise the dead, even though it does get progressively more boisterous as it goes on. More than anything it shows just how effective a well-conceived arrangement can be. There’s nothing particularly noteworthy on its own here, they’re using pretty basic components to keep things moving, but they’re chosen from the rock playbook rather than awkwardly trying to fit pieces in from other more highly regarded styles. Because they keep it simple it never loses its way and shores up the flaws found elsewhere. You can easily shift your focus to the band and find the record to be a pretty typical release in rock for the summer of 1949, whereas if the burden were to fall on the other aspects it’d be something you might not even stop to notice. You might not say I Got A Country Gal was an auspicious debut for either of them, artist or label, well in Nunn’s case his third debut in some form or fashion, but it fits well enough into the world they both inhabit. Besides by this point it’s not just the big hits and creative leaps that are most important for rock ‘n’ roll’s long term prospects, but rather it’s the constant influx of more creative individuals throwing their fate in with the music that provides the surest signs of its long term health as a genre. The more ubiquitous the sound became in society the better it was for all of us. Leave a reply on "Bobby Nunn: “I Got A Country Gal”"